It’s simple and easy prep. Pre-cook pieces of sausage and have them in the freezer. It makes for really quick meals and so much better for you than any take out. It’s easy to use leftovers too. If you prefer really spicy sausage it would be great with Creekside Meadows Xtra Hot Italian or even our Mexican Style Chorizo. Recipe serves about 6 people but it’s easy to halve or double it for a crowd. From Farmer and Cookbook Author Shannon Hayes. The Grassfed Gourmet- if you don’t have her books seriously you should! Heat 2 tablespoons lard or olive oil over medium heat in a large oven proof pot or cast iron skillet or dutch oven. Brown the sausages 3-5 minutes each side- you aren’t cooking them through just browning them. Remove and cut into pieces about the same size as the potato wedges- I cut my pieces into 2-3 pieces. . Pour off the fat, add another 2 tablespoons of lard or olive oil, add the onions and saute until transparent. Add in the potato wedges and cook about 5 minutes on high heat. Stir often so they don’t stick. Return sausage and their juices to the pot, add in the salt, pepper, cayenne. Pour the wine over the top, add the rosemary. Cover and bake about 1 hour until the potatoes are pierced easily with a fork. I served these with some steamed carrots and fresh applesauce. The dish calls for 1 cup of dry white wine and I know someone won’t like this. Remember the alcohol cooks off and leaves that wonderful flavor behind. I would assume apple cider or chicken broth could be used but of course imparts a different flavor. I have not tried either but let me know if you do try a non-wine liquid so I can share the results! If you happen to have leftovers…. I cut everything into smaller pieces then add to a frittata or just reheat on the stove top. I warm up a small cast iron pan, add in some olive oil, lard or butter, then saute everything until warmed. Simple an amazingly simple roast and so many ways to be prepared. Popular for grilling and oven roasting. I know roasts can be intimidating and many think they take a long time or only for those fancy french chefs. Ha. so not true! The thing I have found over the years is yes I can overcook these babies easily. Key is a low oven temperature AND my newest tool. 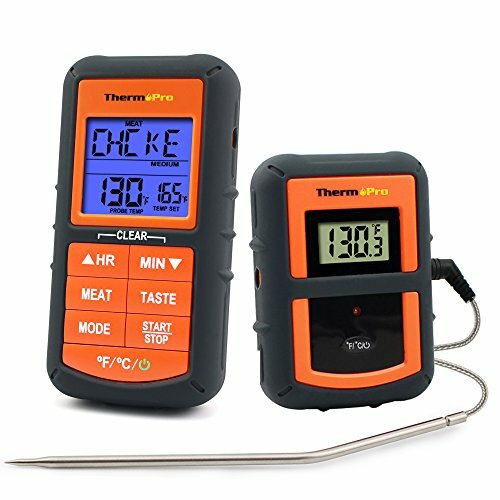 An ovenproof remote thermometer. See below for the link to mine. So how do we get boneless loin roasts and why do we get them? Our pigs as you know are born and raised on the farm. When they are to size we bring them to our USDA butcher for processing. It's the only way we can legally sell our pork by the individual cut. We've been using this butcher for over 15 years now and they do a nice job. Almost perfect usually. Over the years they've worked with us to help us figure out cuts that customers are familiar with and will find easy to prepare while also being the right size for meals. Chops and loin roasts are from the loin and many butchers just cut the loin all as chops but there are different types of chops, some have white and dark meat with more bone, some have more marbled meat but still quite a bit of bone and then there are my favorite the center cut which is the classic chop look. White meat and small bone. We have only the center of the loin cut for chops, I call them center cut but I find some call them rib chops. On one end of the loin we have cut Country ribs and the other end we have them debone a small 2-3 pound roast. Over the years we've had to introduce customers to these cuts because they often don't see them or overlook them at the store or unfamiliar with cooking them. It doesn't help that some cookbooks call them different things either! Country ribs are in the simplest term (I'm keeping it very very simple) a butterflied chop from the rib end, some dark meat, some white meat and a small amount of bone. Quite versatile. More on them in a later blog. Chops- I've posted before on them and more coming soon. I know many people are intimidated by cooking whole roast. That big hunk of meat may seem too much or you think it take too long to cook or is only for fancy french chefs- ha! It's really pretty simple and of course delicious. 2 1/2-3 pound boneless pork loin roast from Creekside Meadows Farm. Thawed and at room temperature about an hour. Really it's bad to put a cold roast in the oven=tough. 2 tablespoons lard (or butter). Grind or crumble the herbs by hand or grinder, add in the salt and garlic. I then add in a bit of olive oil or lard, mixing with my fingers to make slightly wet rub. You can also do this in a grinder for a finer rub which is often better but it's up to you. Don't stress on it. Our boneless roasts are netted. Remove the net by just sliding it off, don't cut it you will be using it. Using sharp knife butterfly the roast, basically cut through one side and leave the other side intact so you can open it like a book. Smear the inside with 1 tablespoon of the lard (or butter if you must). then spread about 1/2 the herb mix all over the inside. Fold the roast up and slide the netting back over it. Okay if you messed up the netting use some cotton kitchen twine to tie it up nicely. I do this to help keep the inside of the roast really moist and add more flavor. Some of our roasts have a good layer of fat on the outside for a juicier finish but sometimes they do get over trimmed. It happens. When I roast one with not much outside fat cover I use lard on the outside and inside of the roast. So make adjustments if you need to. Smear the outside with remainder of the herb mixture. Rub it in really well. This is where it helps if you made your rub really fine in a grinder so all that garlic is fine and sticks better. Heat up an ovenproof skillet or dutch oven, add a few tablespoons of lard or olive oil. Once it's sizzling add the roast and brown the top and sides evenly about 2 or so minutes each side. Get a good sear to seal in those juices BUT don't sear the bottom, you don't need to. Remove to a plate. Add a bit of lard or oil to the pan. Add in the apple and onion, cook, stirring often until the onion is soft and lightly browned. Stir in the wine, a 1/2 teaspoon more thyme or some fresh springs and the bay leaf. Place roast back in the pan. Cover tightly and roast at 225F for 50-80 minutes. Until internal temperature is 145. If you don't have tight fitting lid use some heavy foil and seal as tightly as you can. Then put on your wish list a good oven proof skillet with lid or a dutch oven- no need for fancy just decent quality. These can often be found at estate and garage sales and thrift shops instead of buying new. I find it's best to have an oven proof thermometer in the roast so you can easily check the temperature and not overcook. See below about my new thermometer. Tent and let it rest 15-20 minutes before slicing. For a nice sauce. Pour off the juices into a measuring cup, but use a strainer to get out the thyme and bay leaf, add chicken broth until you have about 1 1/4 cups. Pour back into the pan and simmer over medium heat. Season with salt and pepper as needed. You now have the most perfect roast with a delicious pan sauce in a bit over an hour. All meat thermometers are not the same and many are just not meant to be in the oven. You can find these at any kitchen supply place or high end grocery stores or do what I do and check out Amazon.